We are getting closer and closer to the chilly winter months. It’s time to dig out our cozy sweaters and unbox our winter wardrobe. Just because the weather is changing does not mean you need to stay indoors. Sitting with a warm cup of tea by an outdoor fire pit is a great winter pastime. Choosing the right fire pit is not difficult, but here are some things you need to know. A fire pit can be a great addition to your outdoor space for all seasons. In the summer, s’mores can be made during night time campouts. In the winter, cozying up with a blanket and a hot beverage is relaxing. It’s important to keep in mind the size of your outdoor area. We often think of a fire pit as a large round center of the room piece. Fire pits are not always large and bulky. There are dozens of styles and materials that can work in any given space. If your yard or patio is on the smaller side there are options that will work for you. At Patioworld, our designers are experts at matching the right fire pit to your existing patio setting. Fire pits come in different styles and shapes, but also have different ways of providing the needed flames. This type of fire pit is more like a campfire, providing the heat through the burning of wood. Although this is the most nostalgic of fire pits they also tend to be the highest maintenance. Keeping a large stock of wood to keep heat going is essential. These fire pits create a lot of ash, which in turn creates more cleanup. To keep these fire pits in working order you must have a dry covered area to keep them when not in use. Propane fire pits are the most convenient of fire pits. There is no feeding the fire with wood, no ash, and most are weather resistant. Simple to turn on and off makes it easier to enjoy it at your leisure. When your fire pit runs on propane you should keep an extra propane tank available. No one wants the party to end suddenly when it runs out! Gel fire pits are another convenient option for an outdoor fire pit. With a clean burn that has no scent or smoke. 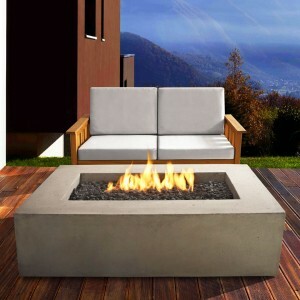 Gel fire pits require the purchasing of gel which can be hard to find in local stores. Gel is easier to find online and have shipped to your home. A downside of gel fire pits is that they do not give off as much heat as the other options. So if you are looking for a roaring fire this one may not be for you. Instead, gel is mainly used for ambiance in an outdoor setting. In order to have a natural gas fire pit you must have a natural gas line. Running a gas line can be costly, but the upside is you never run out of fuel. Your fire is ready to burn when you are with the flip of a switch. Consider that because your fire pit is hooked up to a natural gas line it is not able to be moved. Your fire pit will become a permanent fixture in your outdoor space. Knowing your space and what you are looking for when it comes to your outdoor fire pit is key. Once you decide on the size, style, and burning option you are ready to go. Enjoy sitting beside your warm cozy fire pit even with the chill of cooler weather.